Do you want to quickly share files without wires between MAC systems around? 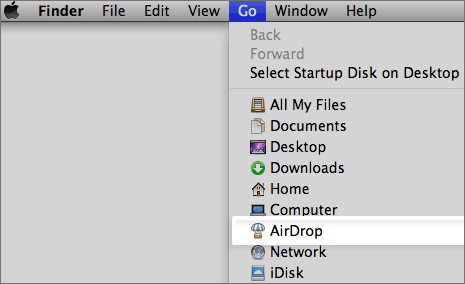 MAC OSX Lion bring new Airdrop feature that allow wireless sharing of files. Best part, it does not require sharing user to be on same Wi-Fi network. It only requires Wifi hardware between sharing systems. Effectively, if you have a newer MAC system with Lion operating system – you are all set for sharing via Airdrop feature. Airdrop allows you to share and send files wirelessly without the wifi network. It uses peer-to-peer Wi-Fi between participating Mac computers and hence doe not require a wireless network infrastructure or a base station. It can detect Airdrop users within 30 feet of distance from you. Once users are detected, you can start sharing files with simple drag drop – there isn’t much to configure or setup for wireless file sharing via Airdrop. 1. Make sure you upgrade to MAC OSX Lion on your existing MAC system or using a new MAC system with preloaded MAC OSX Lion operating system. 2. To use Airdrop in Finder, head to GO menu option and then click Airdrop option. Once activated, Airdrop will attempt to detect all Wi-Fi-enabled (hardware wise) Macs running AirDrop that are near your computer. 3. Once you have user with whom you want to share files via Airdrop – drag file to specific user listing and click Confirm to begin wireless sharing. Is there a way to keep Air-Drop open all the time? It seems odd that both computers have to have AirDrop running for this to work.